Daleela has been belly dancing for 23 years and is in strong demand throughout California. "You are a very beautiful woman and your splendid performance is a wonderful blend of art and sensuality." "THANK YOU! You were beautiful and inspiring to watch, and so encouraging and positive when it came to teaching us to dance. Everyone commented on how MUCH FUN they had and how comfortable they felt. You are amazing! The belly dancing was everything we hoped for and MORE! Stephanie will always remember her outrageously different bridal shower." Jane and family (Bridal Shower - 2005) "I didn't want to let a day pass without saying congratulations! That was an outstanding production last evening. The sequencing was great and the dance performers seemed to understand what it takes to entertain a group. Outstanding piece of work!" Daleela's performance can include Veil, Sword, Cane, Zills/Zagat (finger cymbals), Dance Lessons, and two or more dancers! It's up to you! 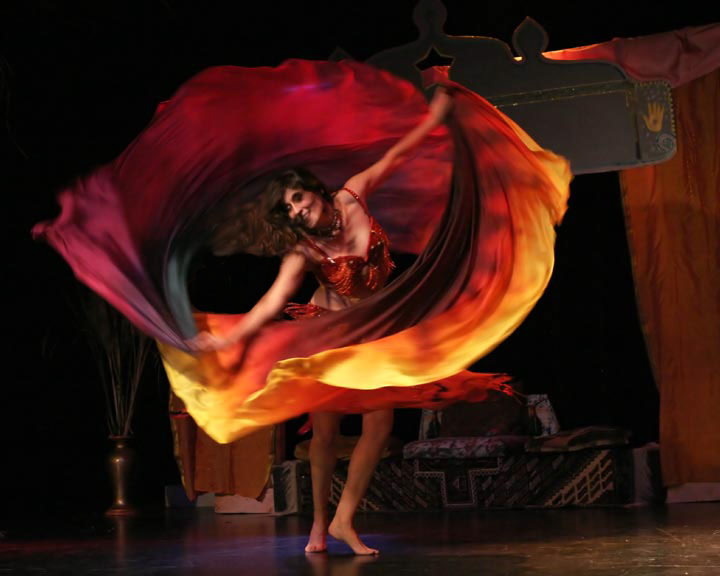 Three Belly Dance Show Packages! v Hula/Tahitian/Belly dance moves performed in Hawaian costumes set to Arabic/Hawaiian music. Wow! v See the beautiful Tania from Tahiti perform her beautiful, Island dance. v You will never forget this one! v A mini dance lesson for 10-15 minutes. This is where we invite your guests to dance with us! This is the most festive part of the night! v 10-15 minute mini Gypsy dance lesson with Esmeralda right after the show. This brings gypsy magic to any event! v 10-15 minute Hula lesson after the show. No one will be able to resist coming up to learn the Hula with Tania! A belly dance Gift Certificate good for one free group lesson with Daleela, for the guest of honor (or his wife). Esmeralda's magic Finger Cymbals are included for the guest of honor! Something to remember her by! Tania will give you a sacred gift from the goddess Pele: A Seashell Necklace from the Island. Sambandha - Music of the World from Tim C Anderson on Vimeo. This exciting world music and dance show may include a beautiful Hawaiian dance, Exotic Tribal Belly Dance, Exciting Irish Dancers, a Romanian Gypsy number, as well as a charming Gypsy Fusion Belly Dance and a dramatic Tahitian Dance. Fun audience participation is included at the end! Daleela also performs a fusion of Belly Dance and Flamenco (Spanish Dance). NEW! Exciting Belly Samba Dancers for your next event! Dance Lesson Gift Certificates Available!